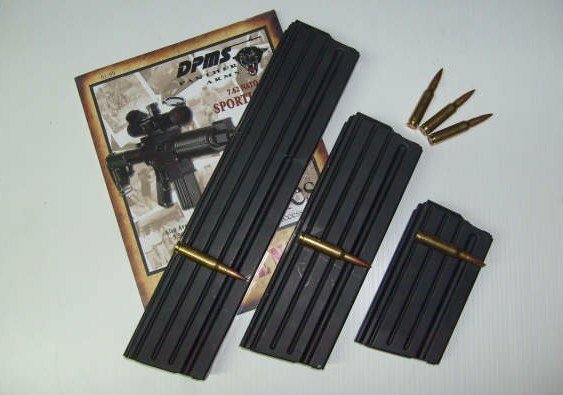 Higher Capacity 55-Round 5.56mm NATO and 32-Round 7.62mm NATO Rifle Magazines for Tactical AR (AR-15 and SR-25-type) and M14/M1A Rifles/Carbines/SBRs (Photos and Video!) | DefenseReview.com (DR): An online tactical technology and military defense technology magazine with particular focus on the latest and greatest tactical firearms news (tactical gun news), tactical gear news and tactical shooting news. All photos contained in this article were taken by either Higher Capacity, LLC or DefenseReview.com (DR), and are copyrighted. Higher Capacity and DefenseReview.com own the copyright on their respective photos. DefenseReview.com’s photos were shot with a Canon PowerShot S90 10-megapixel digital camera (still camera with video capability). DefenseReview (DR) recently broke the story on the SureFire HCM (High Capacity Magazine) 60-round and 100-round 4×2-config “quad stack” 4179 STANAG 5.56x45mm NATO (5.56mm NATO)/.223 Rem. rifle magazines, which are sure to make a big splash at the upcoming SHOT Show 2011. As it turns out, DR isn’t the only company going into production on ultra-high-capacity rifle mags. A company appropriately named Higher Capacity, LLC (HC) has already developed and is currently producing and marketing 55-round and 75-round 5.56mm NATO/.223 Rem. 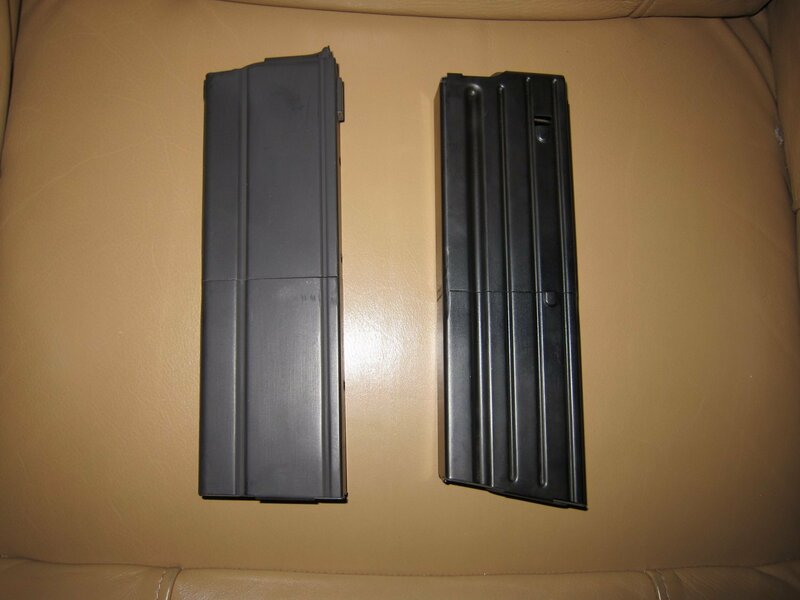 AR (AR-15) mags and 32-round and 45-round 7.62x51mm NATO (7.62mm NATO)/.308 Rem. 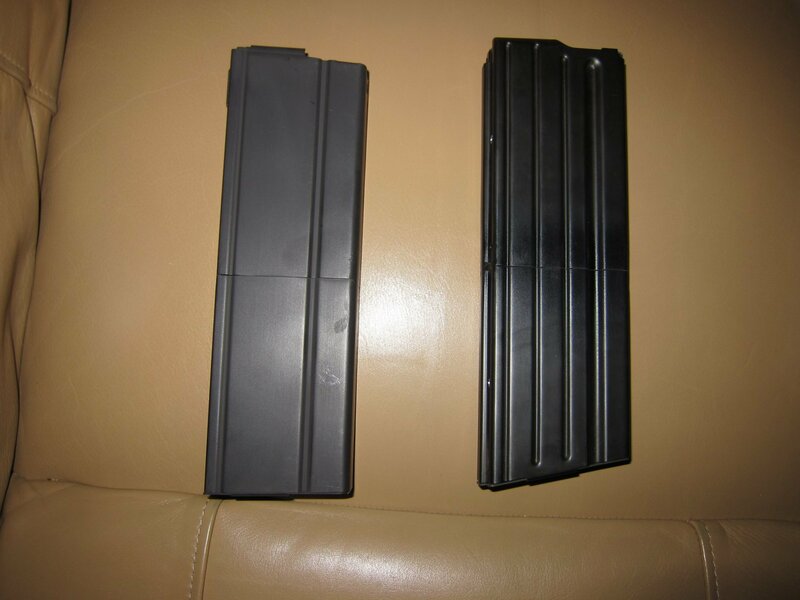 SR-25-type and M14/M1A mags. Unlike the SureFire HCM mags, the Higher Capacity rifle mags aren’t quad stack/4×2 config. They’re just extended double-column mags. The 55-rounder is made by welding two high-quality, lightweight 30-round stainless steel magazines together. All of the Higher Capacity mags utilize a high-quality chrome-silicon spring and (high-quality) stainless steel follower. The welds on the mags DR has received look perfect, and the feed lips look right. Bill Sahlberg, Higher Capacity’s owner/president, informed us that he pays close attention to every aspect of the mags’ construction and finishing, with particular attention being paid to the feed lips. 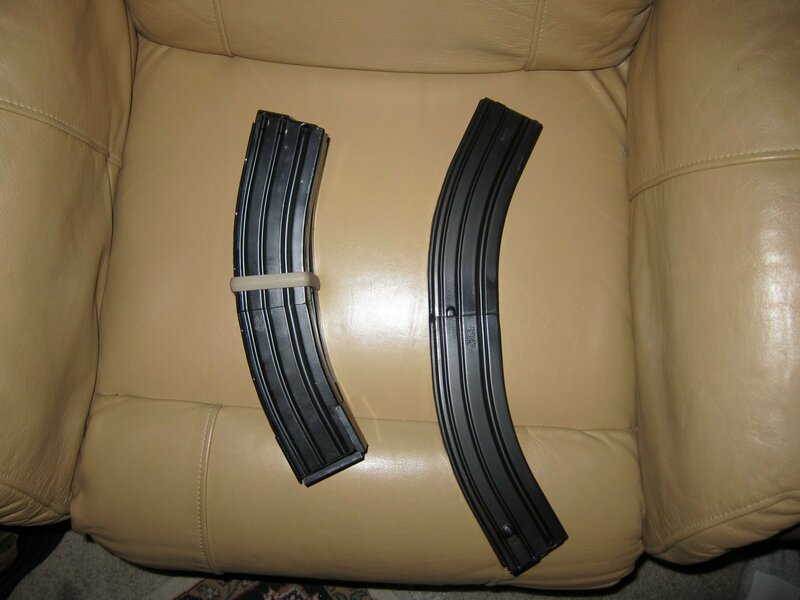 We just got the mags, so we haven’t had a chance to run them at the range, yet. However, they seem to be very well-made. While DR hasn’t run any of the new ultra-high-cap mags, yet, Tactical/technical shooting instructor John Romaszka of Romaszka Tactical Training (RTT) has run the Higher Capacity 55-shot 5.56mm AR mag at the range, already, and he’s informed us that it works like a charm (i.e., reliably), at least under high-round-count range conditions. Defense Review plans to conduct our own testing and evaluation of the Higher Capacity rifle mags at the earliest opportunity. Specifically, we’d like to have Mike Pannone, Jeff Gurwitch, or H.B. (or all three) do a combat-reliability test on them. In the meantime, we’ll leave you with the Higher Capacity company literature on their ultra-hi-cap rifle magazine line, below. 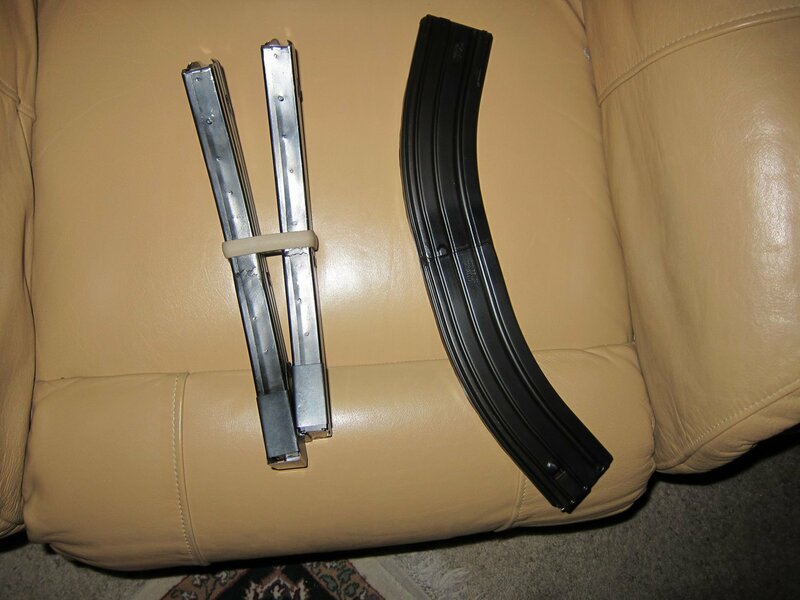 By the way, you’ll notice in some of the photos below that the the two Higher Capacity 55-round mags we received are coupled with an Arredondo AR-15 magazine coupler. That’s how they arrived. We wouldn’t have done that on our own, nor do we recommend it. We will probably uncouple/separate the mags for our T&E, unless we can get two more (separate, individual) 55-round mags sent to us. Frankly, a 55-round mag (one at a time) should be enough, especially if you’ve practiced your speed reloads. “Higher Capacity® was born out of a small niche market that needed to have reliable firearm magazines that simply held more rounds than the standard market provided. 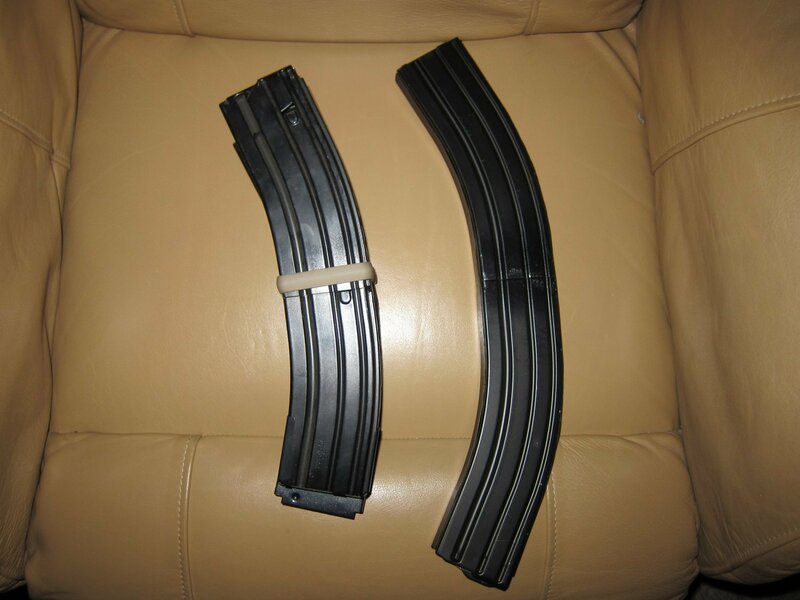 In 1991 I had bought some AR-15 (5.56) 40 rnd Sterling Magazines and paid $150 each for them. I still have these 3 magazines today and they have never failed me. While I do not mind paying for good quality, I still saw the need for more quantity of rounds in magazines and in 1992 started making Higher Capacity® magazines for myself and other shooters. Like the Company name says, all we manufacture is Higher Capacity® magazines for rifles and pistol shooting. We also use the best in raw materials. Most of the components and magazine bodies are made of stainless steel, the finest metal and most non corrosive metal known to man. We also use stainless steel in our followers and springs to guarantee that these magazines will last a lifetime and work flawlessly every time you use them. The benefits of a Higher Capacity ® magazine’s performance and reliability come from the lack of high speed non-human manufacturing and the the following details paid to each magazine built. A normal magazine is cut from a piece of roll stock sheet metal, die or roll formed, and robotically welded, most magazines are never measured or visually inspected by a human against close tolerances. Every Higher Capacity® magazine is welded with purged inert gas and stainless steel. The magazines have a modified SS follower with a custom made stainless steel silicone finished spring, all Higher Capacity® magazines have ammunition inspection holes every 10 rounds. This magazine is nearly 10″ long, like all Higher Capacity ® magazines, these are welded with 304 stainless, ground, and polished on the front and back of the magazines. The feed lips are critically measured and hand polished to a complete burr free surface. Remember, never use oil or solvents to lubricate the followers, these are designed to run dry all the time. The Higher Capacity® AR-15 magazines are made from precision cutting, grinding, and welding the best stainless steel magazines available. Each magazine has a modified SS follower with a custom made stainless steel silicone finished spring. Every Higher Capacity® magazine has ammunition inspection holes every 10 rounds for ease of loading and knowing how many rounds are still available at a quick glance. This 55 round magazine is nearly 12″ long and not designed for prone shooting. Like all Higher Capacity® magazines, these magazines are welded with 304 stainless, ground, and polished on the front and back of the magazines. The feed lips are critically measured and hand polished to a complete burr free surface. Remember, never use oil or solvents to lubricate the followers, these are designed to run dry all the time. 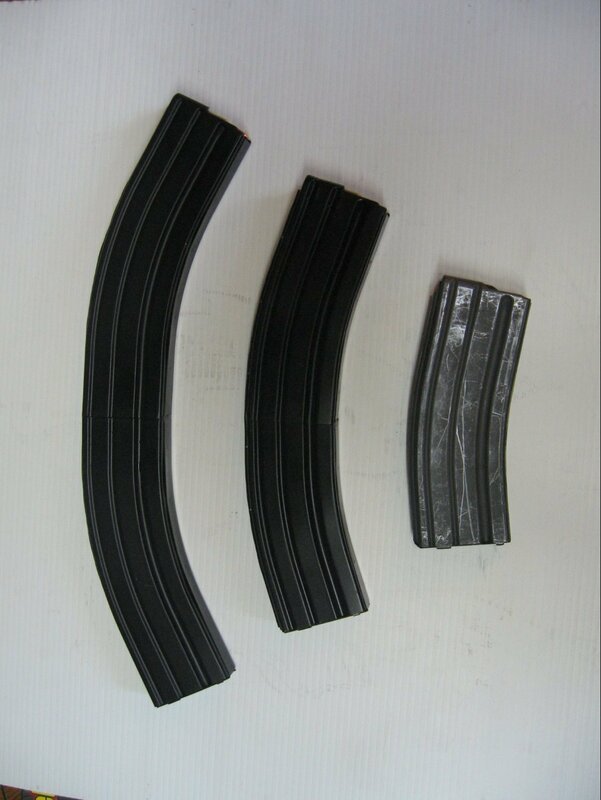 Please note that these magazines will fit 5.56 NATO/.223 ammunition with an overall cartridge length less than 2.260″. If you are a reloader and make your rounds longer, you may have feeding issues. Mfg rifle compatibility includes all M-16/AR-15 variants. Using crappy reloaded brass out of spec will only cause you and your gun unnecessary problems. KAC SR-25 EM Carbine: 7.62mm NATO/.308 Win. Tactical AR Battle Carbine/Rifle Outfitted with Leupold 1.1-8x CQBSS Tactical Rifle Scope for U.S. Military Special Operations (SPECOPS) Mountain Warfare Ops in Afghanistan: DR Photos from SOFIC 2010! Previous: General Atomics MQ-9 Reaper UAS/UAV Retrofitted with Gorgon Stare Electro-Optical/Infrared (EO/IR) Multi-Camera System: The All-Seeing Eye in the Sky…You Look at It, You Die. Next: Ghost Rocket 3.5 lb. Trigger Control Connector for Glock Pistols Enables Better Competitive Tactical Shooting with a Lighter Trigger Pull and Shorter, Faster Trigger Reset!